DO YOU KNOW OF A SUPPLIER FOR SOFA BED HINGES? 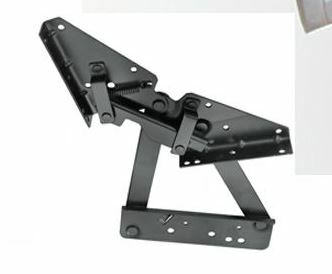 Re: DO YOU KNOW OF A SUPPLIER FOR SOFA BED HINGES? a company called Central Texas Supply in Austin carried those kinds of things. I searched the internet but didn't find them - maybe out of business - can the ones you have be repaired ? I think that Central Texas Supply merged with San Antonio Supply and became Capitol City Supply many years ago. Yes, sometimes they can be welded. Just depends on where the break is. as long as the weld doesn't interfere with the tabs that go "click-clack". Every now and then, I get in one of those old sofa beds with the old "click-clack" hinges that are behaving cantankerously. I've tried to order replacements from my normal suppliers. But the answer was always the same........."We used to carry them, but we don't anymore". Like Stephen, I've found them online from China. But some look really thin, or they only sell in large quantities. I've decided that if I get in another sofa bed that needs new hinges, I'm just going to advise the customer to abort.